The Warriors latest coronation is here. 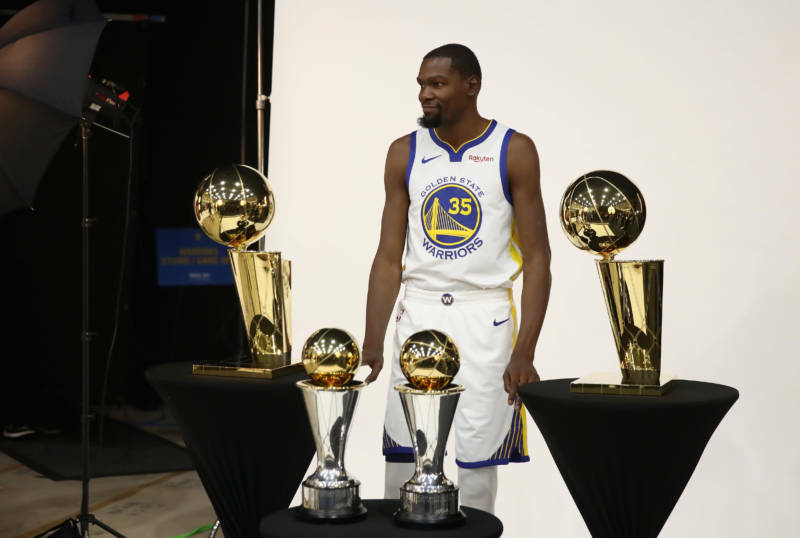 Coming off back-to-back NBA championships, the Golden State Warriors kick off their campaign for a three-peat at home against the Oklahoma City Thunder on Tuesday. LeBron James is in L.A. now, the Western Conference remains stacked and the Boston Celtics are rising in the east, but the Warriors are once again the unquestioned favorites to lay waste the rest of the league — FiveThirtyEight's latest predictions give them a 49 percent chance to win another championship, just slightly worse than a coin flip. For casual fans, the impulse to tune out until the playoffs start in April is understandable. But here are several interesting subplots to follow this season. The Warriors are in the middle of an historic four-year run: three championships, four Finals appearances and a record-setting 73-win season (2015-2016). In the process, they’ve helped reshape the way the game is played on all levels. There's no question that this team has earned a place in any "best teams of all time" discussion. But when talking about dynasties, four years of dominance only gets you in the conversation. That Celtics team is the only team in NBA history to appear in five straight NBA Finals, a feat the Warriors can match this season. No team has accomplished the coveted three-peat since the Shaq/Kobe Lakers (2000-2002). “All those things we should talk about because it's kind of rare air,” he added. The three-peat talk will only intensify as the season progresses, and another dominant season will bolster the Dubs' dynasty resume. As with all the great teams, as soon as "dynasty" status is approached, the clock starts ticking. Specifically, Kevin Durant can elect to opt out of his contract and enter free agency after this season, a move that some are expecting (subscription required). Klay Thompson will also be an unrestricted free agent after this season and is in line for a massive contract. Draymond Green is also approaching a mega extension in the next year or two. How long can general manager Bob Myers and the Warriors front office massage the salary cap, not to mention the big personalities, and keep this group of superstars together? There is a lot of Zen-like talk coming from this team — “stay in the moment,” “enjoy the now,” etc. That same approach should also apply to bored fans who don’t know what else there is to root for. Your mantra for this season: Enjoy this amazing team and their amazing run while you still can. 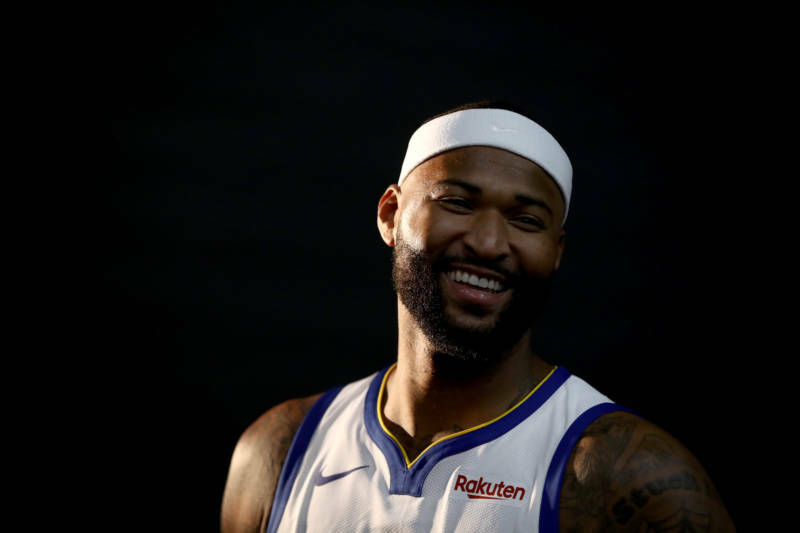 The biggest Warriors news this offseason was the surprise signing of yet another NBA all-star, DeMarcus “Boogie” Cousins. Bay Area fans may already be familiar with Cousins from his days with one of the NBA’s junior varsity teams, the Sacramento Kings (sorry Kings fans). Cousins is rehabbing from a torn Achilles suffered in January while playing for the New Orleans Pelicans. The team hasn’t announced a timetable for his eventual return, but Cousins is expected to miss at least the first few months of the season. 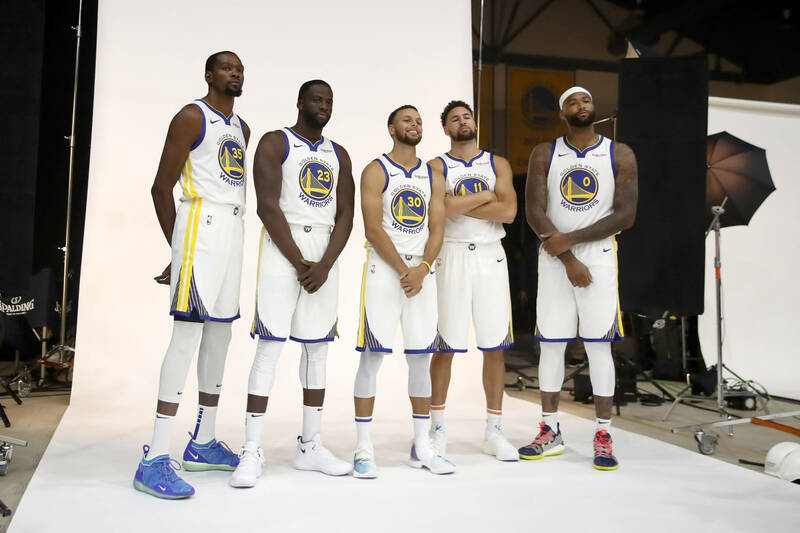 With Boogie waiting in the wings, the true heights and identity of this latest Warriors team won’t be known until the season is well underway. When he does return, the Warriors will have to adjust their style of play to incorporate another talented All-Star, much like they did two season ago with Durant. How easy will it be to incorporate Cousins into their free-flowing style? “Speculation and concern is for you guys. That's not a concern of mine. We all know how to play the game of basketball. So everything else figures itself out,” Cousins said. New Warriors guard Damion Lee, who will spend time with both the Warriors and their G League in Santa Cruz, is actually Stephen Curry’s brother-in-law. Lee married Curry’s younger sister Sydel this offseason. The Warriors moved into the Oakland–Alameda County Coliseum Arena at the start of the 1971 season and have called it home ever since. This year will be their last played in Oakland before moving into their gleaming new billion-dollar Mission Bay arena next season in San Francisco. I doubt longtime East Bay fans think their team’s move to San Francisco is dope. 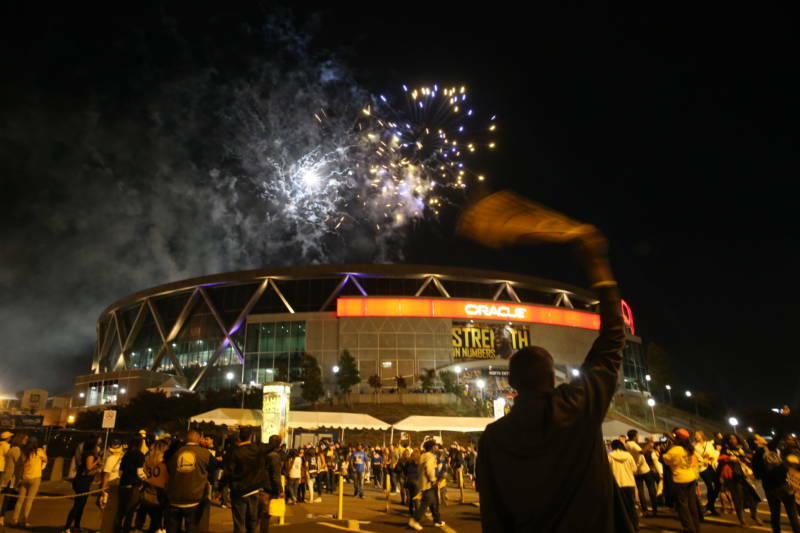 Speaking in June after the team’s championship parade in Oakland, third-generation Oaklander and diehard Warriors fan, Lukas Brekke-Miesner spoke to KQED's The Bay podcast, echoing a common theme among East Bay fans. “When the Warriors move to San Francisco, I don’t think I’ll ever go to a game. ... I think my days of being a diehard fan are gone. I know even if I wanted to be a diehard, I know I wont be able to afford a ticket in that arena,” Brekke-Miesner said. Players and coaches do seem like they'll miss playing in Oakland, too. "That's one of the things Steve [Kerr] talked about in our first meeting as a team this year, was our love for Oakland and the fans," Klay Thompson said after Sunday's practice. "I look at the pictures on the wall, I see the parades. Just driving around town seeing how happy people are, it gives me, gives us, motivation to keep going." "The new arena's going to be amazing, and we're all excited about that, but we're all bummed to be moving on from Oracle," Kerr said, calling the move "bittersweet." While attendance numbers and TV ratings will likely remain at astronomical levels, the Warriors' last year in Oakland symbolizes the changing Bay Area. This is not the hapless Tim Hardaway/Chris Mullin Warriors, or the gritty, surprising "We Believe" team of 2006-07. They now represent the moneyed, tech elite. As they move from the Town to the City, will the Warriors remain the Bay’s team?